The Chandra X-Ray Observatory recently released four of the most stunning images of galaxies we've ever seen — but these mind-blowing pictures couldn't have come into existence without the help of amateur astronomers and photographers. 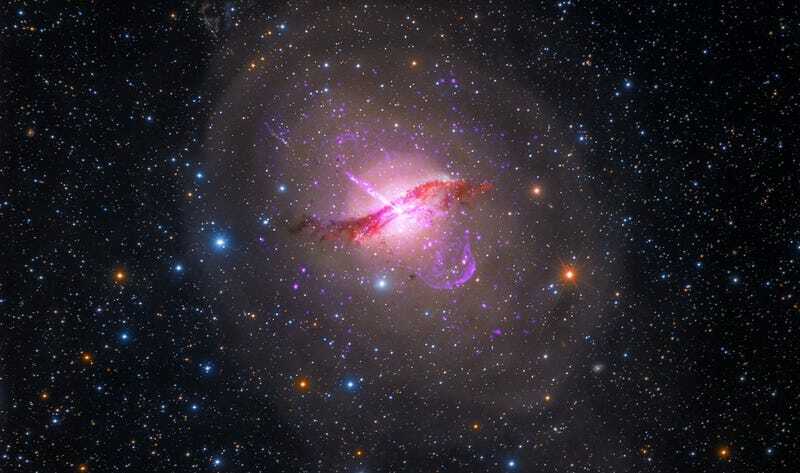 Above image: Centaurus A is the fifth brightest galaxy in the sky — making it an ideal target for amateur astronomers — and is famous for the dust lane across its middle and a giant jet blasting away from the supermassive black hole at its center. Cen A is an active galaxy about 12 million light years from Earth. What happens when the work of amateur astronomers and astrophotographers is combined with the data from some of the world's most sophisticated space telescopes? Collaborations between professional and amateur astronomers reveal the possibilities and are intended to raise interest and awareness among the community of the wealth of data publicly available in NASA's various mission archives. This effort is particularly appropriate for this month because April marks Global Astronomy Month, the world's largest global celebration of astronomy. The images in this quartet of galaxies represent a sample of composites created with X-ray data from NASA's Chandra X-ray Observatory, infrared data from the Spitzer Space Telescope, and optical data collected by an amateur astronomer. In these images, the X-rays from Chandra are shown in purple, infrared emission from Spitzer is red, and the optical data are in red, green, and blue. The two astrophotographers who donated their images for these four images — Detlef Hartmann and Rolf Olsen — used their personal telescopes of 17.5 inches and 10 inches in diameter respectively. More details on how these images were made can be found in this blog post. M81 is a spiral galaxy about 12 million light years away that is both relatively large in the sky and bright, making it a frequent target for both amateur and professional astronomers. M101 is a spiral galaxy like our Milky Way, but about 70% bigger. It is located about 21 million light yearsfrom Earth. X-rays from Chandra reveal the hottest and most energetic areas due to exploded stars, superheated gas, and material falling toward black holes. Infrared data from Spitzer shows dusty lanes in the galaxy where stars are forming, while optical data traces the light from stars. M51 is another spiral galaxy, about 30 million light years away, that is in the process of merging with a smaller galaxy seen to its upper left.